Imagine having to act out an entirely improvised comedy play, constructed from a title from the audience, whilst in the style of a Jane Austen novel. Sounds tricky, right? Actress, singer, director and experienced improvisor, and co-founder of Austentatious, Amy Cooke-Hodgson career is based on performing ‘lost’ Jane Austen novels, made up by the audience. After growing up deeply invested in acting and musical theatre, it came as no surprise that whilst living in Oxford, Amy joined the Oxford Imps, an improvisational comedy troupe. “It’s like a short form show, and it was really the basis for me exploring what is called long-form improve which is what Austentatious is.” From touring together, she was able to really train herself to do long-form improv as a profession. 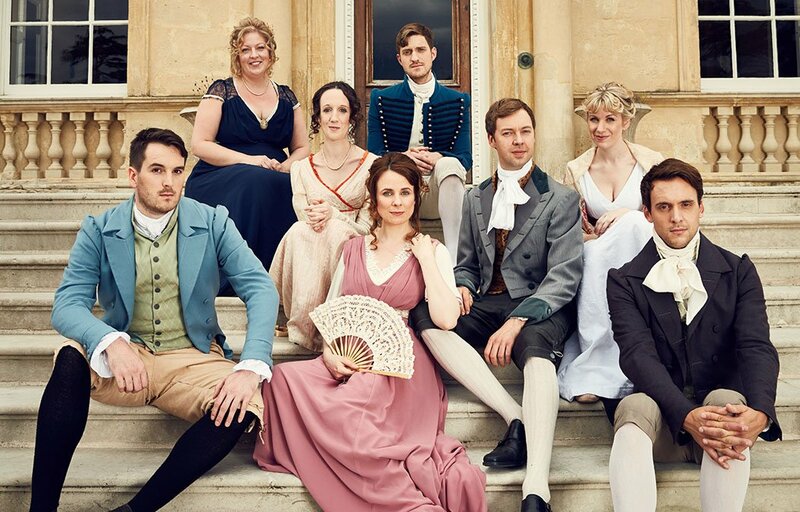 Upon moving to London, Austentatious was curated by Rachel Parris and herself, whilst working, performing and directing with a musical theatre company and Showstoppers, an improvised musical. At the age of 30, Amy decided to head to drama school, to follow her children dream, after she “fell down the typical go to university, get a degree and a job route. At 30, I had a sort of quarter life crisis I guess,” she exclaims laughingly, all alongside Austentatious was developing and beginning to grow. Deciding to start up your own company is daunting no matter the industry, let alone improvisation and acting. Being an English Literature graduate myself, I was intrigued to find out why they chose Jane Austen as the pretence of their company, “We both purely loved Jane Austen and period drama, and thought we could marry the two together with an improv setting.” Joined by Joseph Morpurgo, Andrew Murray, Graham Dickson and Cariad Lloyd, the period dramatics came to play. For those new to improvisation like myself, it takes a while to get your head around how one can perform on the spot, knowing quite literally nothing. “It’s like asking how does a football team rehearse for a match. You don’t play the exact show you’re going to be playing but you rehearse the skills that are needed in order to make a good show.” Through scene work, game playing, practicing similar opening scenes, together it sounds as though it pieces together simply, as she explains, “we just practice skills to one another and then the show on the night is whatever throws itself to us”, she jokes. “It’s a very personal, tailored experience training to be an improviser because there’s no one way of doing it. It’s not like going to a certain university and to come out with the required given skills.” Workshops after classes, from different teachers and coaches, Amy explains it all pieces together naturally, as “there’s so much you have to do in order to develop as an all rounder improviser as it’s very much a personally driven journey.” After all on the night of an Austentatious performance, the cast really do not know anything, quite literally. “Obviously we know the title, and that a typical Jane Austen novel has a protagonist romance, whether it’s good or bad, and we try to honour the themes within Jane Austen’s stories but apart from that we have no clue how it will turn out.” I ask if the titles are a set-back at all, with Amy replying “they are an absolute gift and they are such an inspiration that everything is sort of drawn from that.” From titles such as 00 Darcy, to the Ladyboy’s of Hampshire, it’s hard to know what to expect on the night but that seems to be the true beauty of it all, and it adds a dynamic humour unseen anywhere else. Amy Cooke-Hodgson is touring with Austentatious this Autumn. They are at Brighton Dome Concert Hall on Sun 23 Sept.